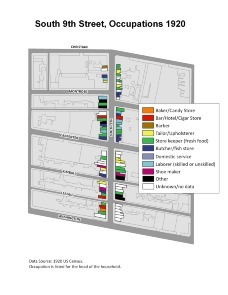 Map of occupations of residents of South 9th Street between Christian Street and Washington Avenue. Data source: 1920 U.S. Census. Data collected by Shimrit Keddem and mapped by Shimrit Keddem and Amy Hillier.